YMAA Publication Center, 9781594395581, 208pp. 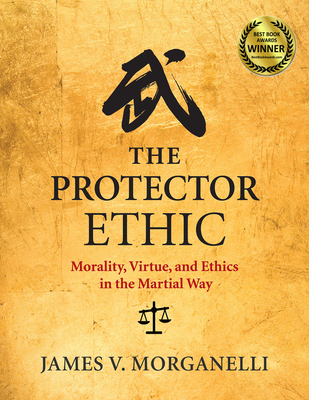 USA Best Book Award WINNER - 2018 Discover how the martial way leads to a protector ethic The Protector Ethic is a deep dive exploring the principles and values that must anchor a modern warrior. The author is compelling, insightful, and not afraid of controversy. As the book begins, we are thrust into the true story of a robbery turned homicide. It happens midday on a train. The victim is twenty-four, and the murderer is eighteen. What unfolds is nothing short of horrific, yet the other passengers refuse to help. James V. Morganelli sees this as a symptom. When we are reluctant to defend ourselves, when we refuse to protect those around us, we become part of the disease. As a martial artist and ethicist, the author says martial arts are much more than technical exercises. They offer us a "physical philosophy"--one that allows us to understand ourselves, teaches us about others, and demonstrates the true meaning of justice. They help us make difficult moral decisions. Ultimately, isn't this why we train? Readers will - Understand natural law, protective instinct, and self-risk.- Examine the martial way of valuing, reasoning, judging, and acting.- Discover how moral relativism, political correctness, and contrived social-justice campaigns do not make people equal. They can actually dehumanize us.- Recognize what it means to be an ethical warrior. Only the great books address philosophy for the contemporary warrior, which is why such titles as Zen in the Martial Arts, Living the Martial Way, and Meditations on Violence have become modern classics. The Protector Ethic is an indispensable contribution to this conversation. "Are you seeking ancient martial secrets?" Morganelli writes. "Here's one. You already know how to defend yourself. A qualified instructor can run you through the basics, but that should take about ten minutes. After that, the serious work begins." The martial way only lives when we treat it as something that can die. James V. Morganelli has been involved in martial arts for nearly forty years. He is the head instructor of the Bujinkan Shingitai-Ichi Dojo, and he holds a master's degree in social philosophy from Loyola University. He is a member of Resolution Group International, experts dedicated to teaching ethical, verbal, and physical skills to civilians, law enforcement, and the military. He lives in Chicago, Illinois.